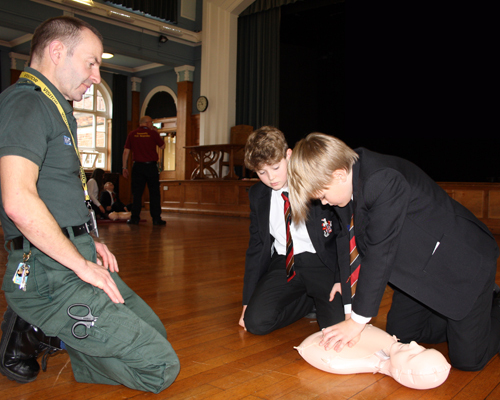 Students in Years 7-9 at Harrogate Grammar School took part in Restart a Heart Day 2018 on Tuesday 16 October, as part of the school’s commitment to creating a generation of future lifesavers. Andy Brown, Head of Lower School, said “We are really grateful to the Yorkshire Ambulance Service for giving up their spare time to provide this invaluable training. The students were thoroughly engaged throughout and really valued the importance of what they were trying to achieve. They asked thoughtful questions about lifesaving and were enlightened by some true stories from the Ambulance staff.” The school has recently installed a second Public Access Defibrillator (PAD) next to the Astro pitch, not only providing further lifesaving equipment in school, but also increasing the number of PADs in the community. Over 100 schools across Yorkshire took part in the event, providing pupils with life-saving cardiopulmonary resuscitation (CPR) training. In total, 300 Harrogate Grammar School students participated and were among 25,000 children across Yorkshire who took part in the world’s largest event of its kind. The Yorkshire Ambulance Service has some of the best survival rates in the country from patients who suffer an out-of-hospital cardiac arrest and this is partly due to a higher than average bystander CPR rate of nearly 50%. The aim is for this to increase to match places such as Stavanger in Norway, where they have a rate of 75%.